Haven't had a proper update on charts around the world for a number of weeks... Here's the U.S. for both April 12th and April 19th with the most recent countries showing chart action at the bottom. Fleetwood Mac's 1988 Greatest Hits collection re-entered the Billboard Top 200 Albums Chart with sales for the week of 2,335 up from 1,152 the previous week or a 103% increase. The sales bump followed the news that Fleetwood Mac would tour in 2014 with a reunited Christine McVie. Total US sales since November, 1991 = 4,740,163. During the same sales period, Fleetwood Mac had 4 albums on the Top 200 Catalogue Albums Chart all experiencing a bump up the chart with "Greatest Hits" leading the pack at No.33. "The Very Best Of" came in at No.34 with sales for the week of 2,328 up 33% from the previous weeks sales of 1,751. Total US sales since it's release in 2002 = 1,649,716. "Rumours" drops two places on the chart to No.43 but increases in sales vs the week prior by 2%. Album sales for Rumours for the week were 2,209 vs 1,639 the previous week. Total US sales for Rumours since November, 1991 = 3,295,004. "Fleetwood Mac", the 1975 self titled album moves up to No.47 from No.89 the previous week selling 2,076 units vs 1,639 the previous week, an increase of 27%. Total US sales since November, 1991 = 1,001,023. This puts the album at over 1 million units sold in the US since Soundscan began tracking sales in November, 1991. "Crystal Visions... The Very Best Of Stevie Nicks" makes an appearance this week on the Catalogue chart, which doesn't happen that often. For chart date April 12, 2014 the album re-entered at No.200 on sales for the week of 1,160 units up 29% over the week prior of 897 units. Based on sales, the album has officially reached GOLD certification in the U.S., but likely surpassed that in albums shipped a while ago. Total U.S. sales to date since it's release in 2007 = 505,512. With a full 7 days selling cycle compiled after the announcement of Fleetwood Mac's 2014 tour, the affect on album sales particularly Rumours and The Very Best Of is evident. These two albums re-enter the Billboard Charts this week - Rumours in at No.187 and The Very Best Of at No.192. Last week's re-entry title "Great Hits" drops off the chart. No sales data available at this time. With the 7 tour dates announced in Canada this fall, album sales in Canada increased substantially vs the week prior. Rumours is up 19% with 419 units sold in Canada vs 352 the previous week. Greatest Hits is up 35% over the prior week with 339 units sold vs 251 the previous week. Total Rumours sales in Canada since sometime in the 90's is 395,228. I'm not sure if Soundscan began tracking sales in Canada at the same time they did in the U.S. which was November, 1991. Total Greatest Hits sales in Canada since Soundscan began tracking is 206,414. Now that 'Crystal Visions' has officially sold enough to go gold, 'Bella Donna' should be certified at least 5xplatinum as well. 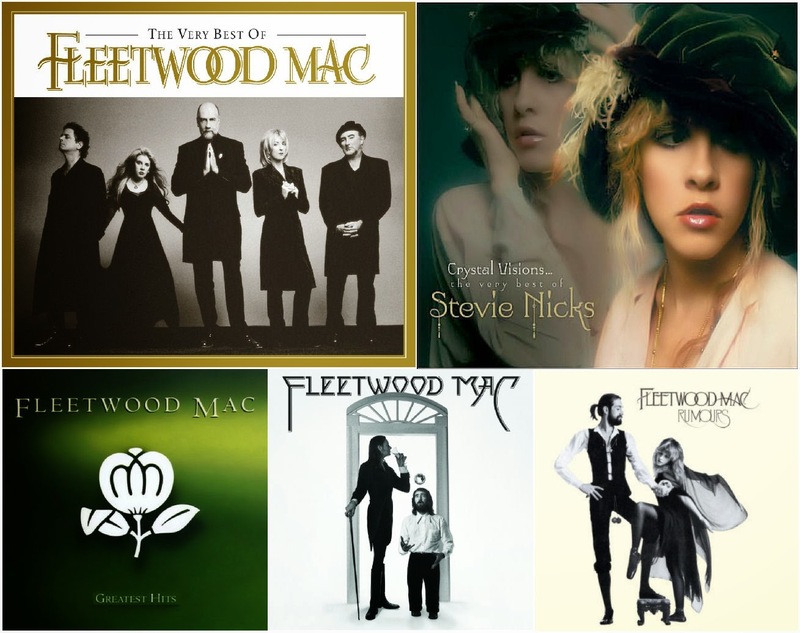 The RIAA has a lot of work to do with Fleetwood Mac's catalogue and Stevie's. I would like to know the chart stats for Golden. Is it even an "official" single, meaning has it been released to radio? Or is it a single in the sense it is a stand alone song, not taken from any album (as a duet). I checked Billboard but couldn't find anything. I think if it's released a single it would be at least another week before it appears there. I really like the album cover to Crystal Visions. I also liked the album cover to TimeSpace. I added "Golden" and the chart that it appears on this week... I'm sure it's the new version of Golden feat. Stevie, but can't be sure as it doesn't indicate.